Breathtaking design meets unrivaled craftsmanship in the KOHLER(R) Tailored vanity collection. No detail was overlooked in the meticulous crafting of this collection, from the premium hardwoods to the specially designed hardware and vanity tops, all available in an array of finishes to create your own look. This Marabou vanity cabinet brims with country charm for a timeless look that is a true classic of American design. Complete your bathroom vanity with a coordinating top, hardware, and accessories from the collection. Furniture-style inset construction for doors and drawers. Two doors and two full and four shallow drawers behind four drawer fronts. Full-extension 18" depth drawers with slow-close under-mount slides for smooth opening. Designed with a dedication to detailed precision, the Clermont wood vanity offers sophisticated style for a variety of bathroom motifs. The beautiful cabinet door features an offset diamond pattern, created by the grain of quarter-sawn ash veneers. Express(TM) installation makes it easy to bring this vanity cabinet home and set it up in a matter of minutes. With a classic look that complements a wide range of styles, the Evandale bathroom vanity combines sink, counter, and wood cabinetry in one easy-to-install piece. The stone countertop includes a backsplash to help protect the wall from water damage. The cabinet's moisture-resistant finish ensures long-lasting beauty. Marabou 48 inch Vanity With 2 Doors And 4 Drawers, Split Top Drawers, Cherry Tweed Breathtaking design meets unrivaled craftsmanship in the KOHLER(R) Tailored vanity collection. No detail was overlooked in the meticulous crafting of this collection, from the premium hardwoods to the specially designed hardware and vanity tops, all available in an array of finishes to create your own look. This Marabou vanity cabinet brims with country charm for a timeless look that is a true classic of American design. 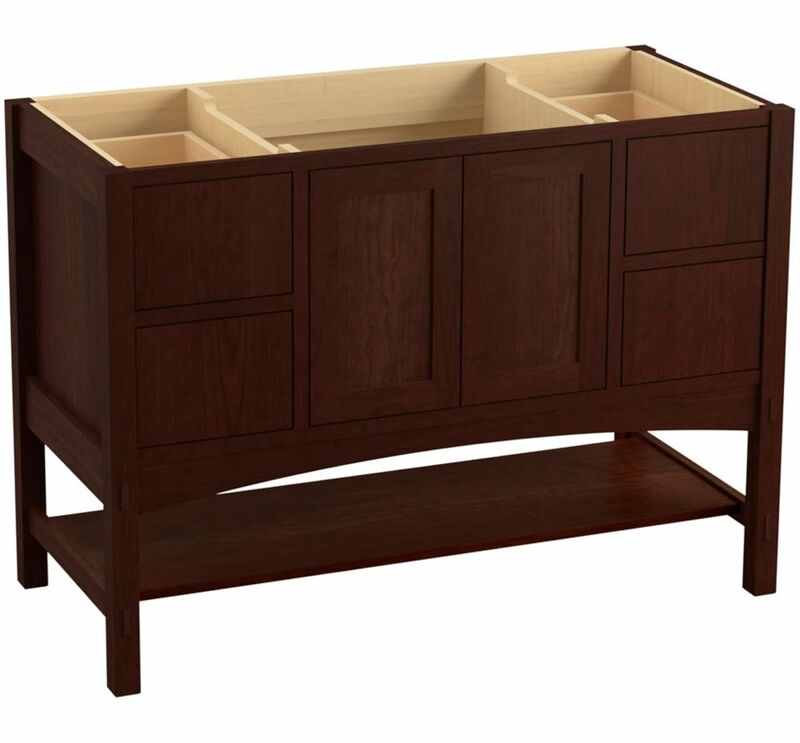 Complete your bathroom vanity with a coordinating top, hardware, and accessories from the collection.